Hi Crafty Friends! Today I'm sharing a layout I created using Gina's Designs chipboard and a digital paper kit from Kitty's Scrap Post. I really enjoy printing my own papers, it's so much more versatile. 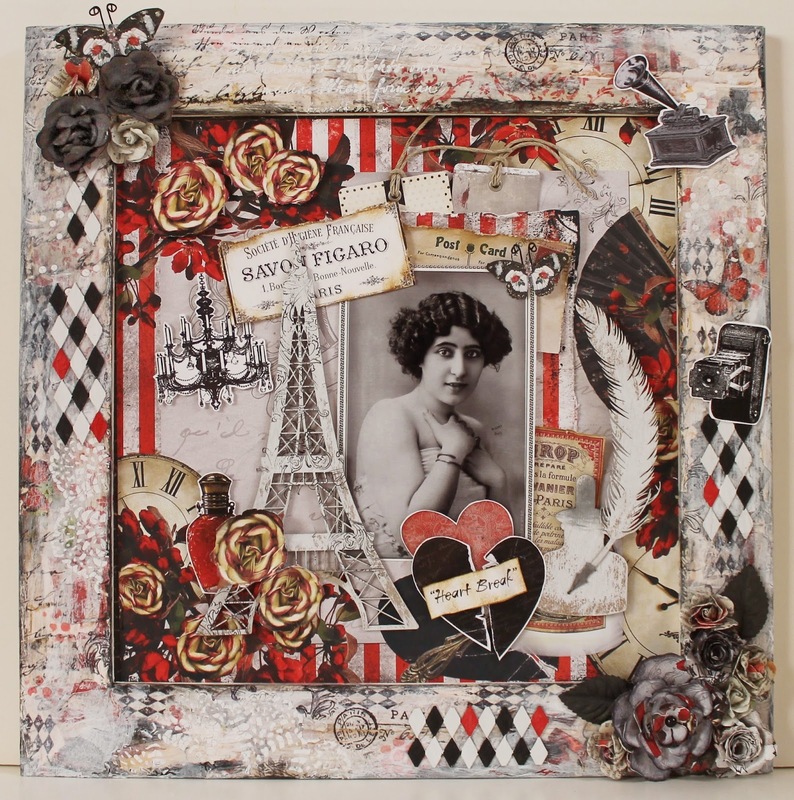 This paper kit is gorgeous combined with some Parisian chipboard shapes from Gina's Designs. I'd been wanting to use our large chipboard Eiffel tower, as well as the pen and ink set, so I was really excited when I saw this paper. I really love using the unfinished wooden frames from Michael's to enhance my layouts and to give me more room to play with some mixed media techniques. To decorate my frame on this project, I printed out some of the design paper onto tissue paper and decoupaged it around the frame. I simply place double stick tape on each end of a sheet of printer paper (I used my ATG gun), then lay a sheet of tissue paper over it. Trim off excess tissue paper before inserting the sheet into your printer. Over the decoupage I added gesso, and stenciling with crackle paste, and a little stamping here and there. I also fussy cut some of the elements from the collage sheets included in the kit and incorporated them into my layout and around the frame. I used my photo printer with matte photo paper to print the vintage lady image which is also included in the kit. I created the flowers at the bottom right of the frame using dies and leftover scraps of paper from the collection.